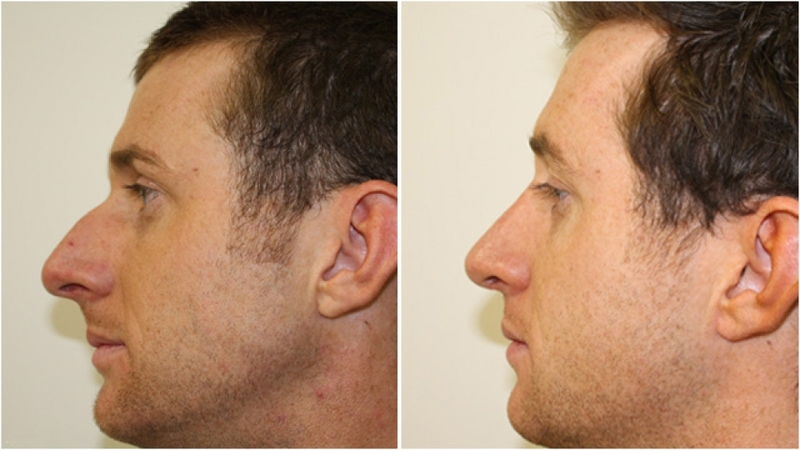 Both upper and lower eyelid surgery can make a dramatic change to the way you feel and look to the outside world. The upper eyelid area is often only amenable to surgical treatment, however, the lower eyelids which usually involve more complex surgery can often be dealt with non-surgically prior to resorting to surgical solutions. Note if you are in a health fund, upper eyelid surgery is often partially rebatable. For more information on each of these individual procedures, please click on one of the subheadings below. 63 year old man, vision impeded by excess, saggy skin above eyes. 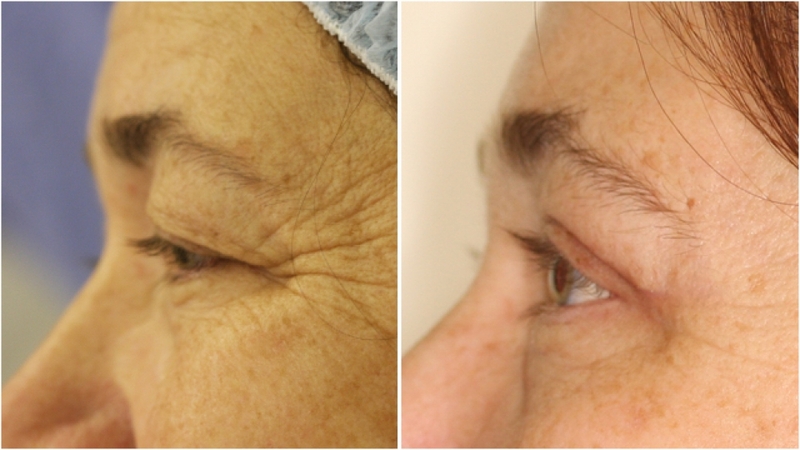 Blepharoplasty surgery performed to restore functionality and aesthetic appearance. 60s, bothered by excess upper eyelid skin obscuring vision and giving an aged appearance. 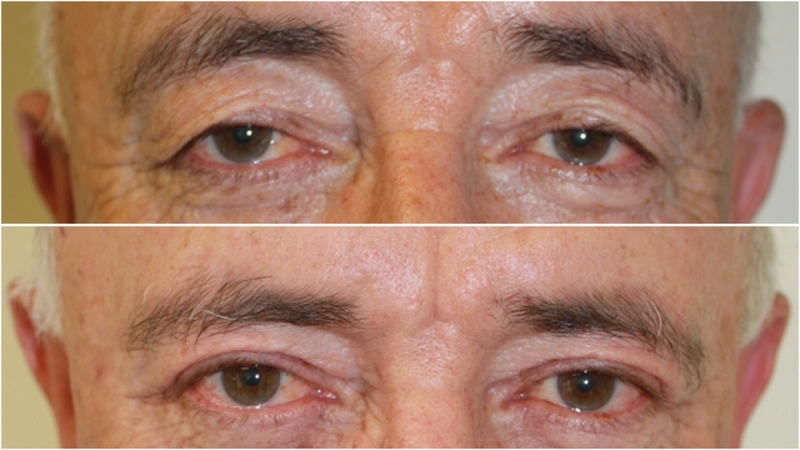 Correction with extended upper eyelid blepharoplasty. 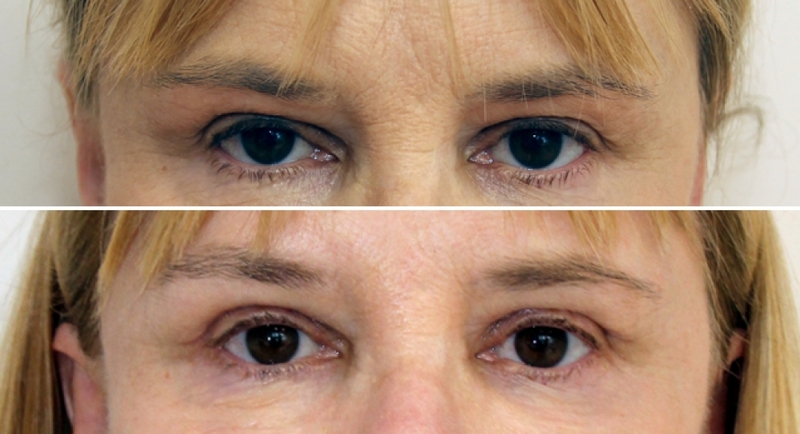 55 year old lady, requesting upper eyelid reduction surgery to restore more youthful looking, open eyes. 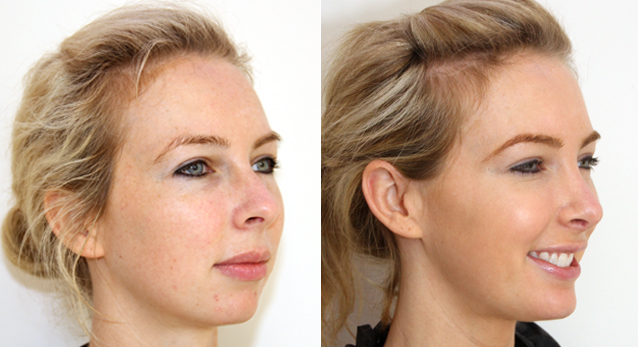 A concomitant direct brow lift has also been done in this case. Late 50s, upper lid reduction performed to restore a more youthful and open eyed look. 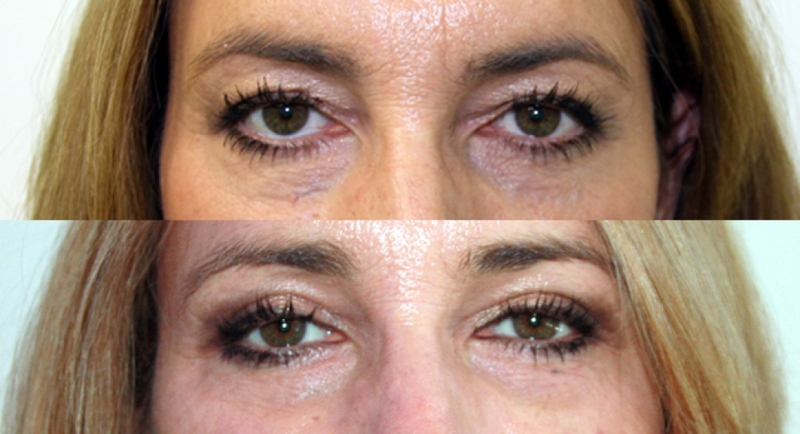 50 yo, upper lid reduction performed to restore a more youthful and open eyed look. Upper and lower eyelid surgery to create youthful appearance of the upper eyelid fold, remove excess skin as well as reposition excess fat of the lower lid. 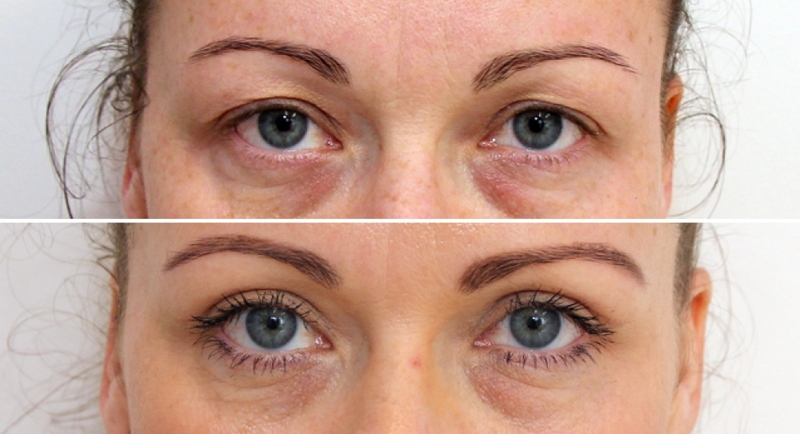 Upper Eyelid Rejuvenation to remove excess skin and create youthful upper eyelid crease. Dr Michael Miroshnik, renowned plastic & cosmetic surgeon, is asked to comment about which body parts of celebrities are most requested in a plastic surgery setting. Upper eyelid surgery, or upper blepharoplasty, can help freshen and revitalise your face by reducing the appearance of heavy, sagging upper eyelids and associated puffiness. In some individuals, the upper eyelid skin becomes so baggy and excessive, that vision itself starts to be impaired. These people benefit functionally, as well as cosmetically, from upper eyelid rejuvenation. 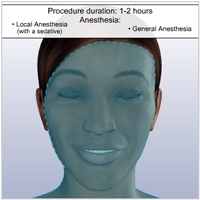 For more information about this procedure, please see our custom, narrated 3D Procedure Animation and print yourself a copy of the procedure description while in the animation menu. Introduction Over time, the eyes undergo changes that often make people feel as if they appear sad or tired. The aging process can cause the eyelids to sag and droop, which in combination with bags and puffiness can make you look tired and older than you really are. In fact, the skin of the upper eyelids can become so baggy and excessive that vision starts to be impaired. Upper eyelid surgery, or upper blepharoplasty, can help freshen and revitalise your face by reducing the appearance of heavy, sagging upper eyelids and associated puffiness. 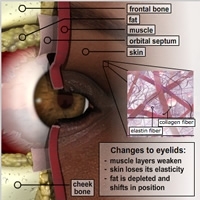 What Causes the Eyelids to Change? 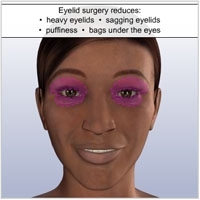 Before you understand how eyelid surgery works, it is important to understand the underlying structure of the eyelids. 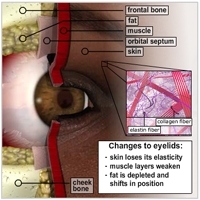 Like the rest of the face, eyelids are composed of layers of skin, muscle, and fat. With time, age and environmental factors like sun damage, cause the skin's support network in the dermis to break down. As a result, the skin loses its structure and elasticity and becomes lax. The muscle layers also weaken, which with the skin's loss of elasticity and the effects of gravity, cause the eyelids to droop and sag. 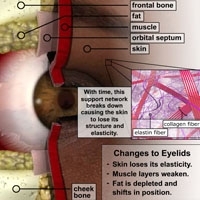 Fat deposits normally give eyelids a full appearance. However, fat too is depleted over time and shifts in response to weakened, sagging muscles, which results in puffiness and bags around the eyes. How Does Outside Lower Eyelid Surgery Work? While there are several different techniques that Dr Miroshnik can use to alter the appearance of the eyes, the standard surgical technique usually involves removing or redistributing fat deposits, as well as removing excess skin and muscle. Depending on the specific problems that need correction, Dr Miroshnik may recommend treating the upper eyelids, lower eyelids, or both. In addition, upper eyelid fullness is often heavily contributed to by a heavy eyebrow. 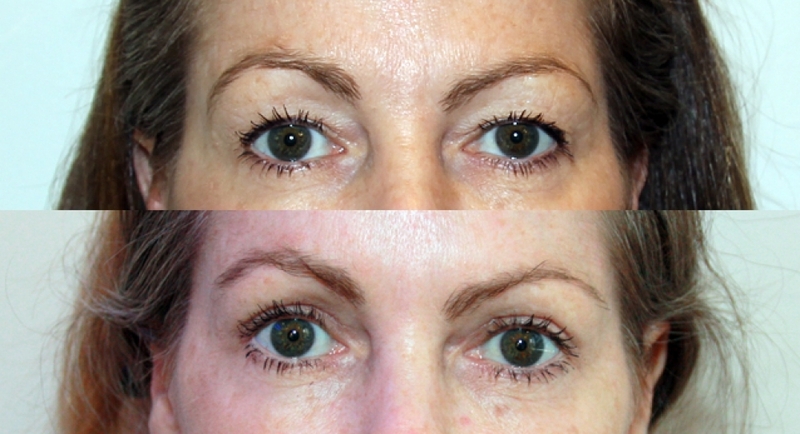 In these cases, a brow lift procedure may be required to achieve optimal results. 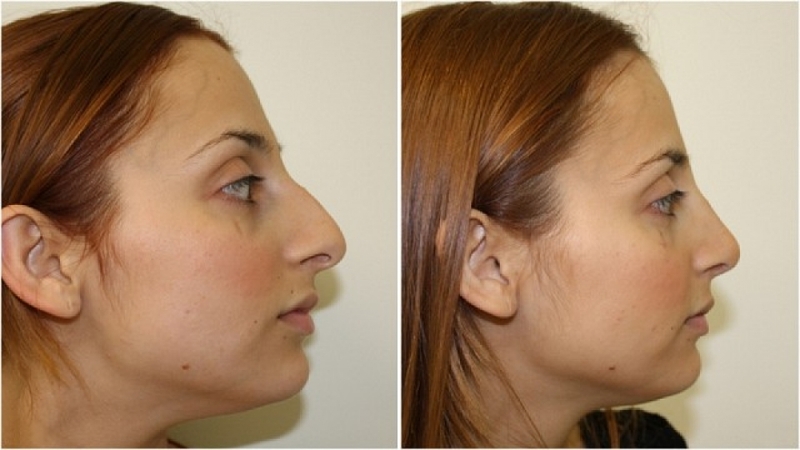 These aspects will all be discussed with you in detail during your consultation with Dr Miroshnik. 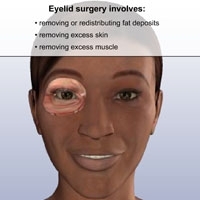 Preparation An eyelid surgery procedure may last approximately one to two hours, depending on the extent of treatment. Prior to the start of your procedure, the treatment area will be cleansed and anaesthesia will be administered. 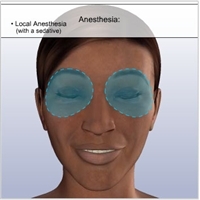 The procedure will most likely be performed under local anesthesia with sedation, in which the eyelids and surrounding areas are numb and you are in a relaxed state during the procedure. Alternatively, a general anaesthetic may be used, in which you are asleep. Incisions Before making the incisions, Dr Miroshnik will draw some incision guidelines based on the amount of skin that needs to be removed. The incisions will follow the natural contours of the eyelid and the resulting scars will be as inconspicuous as possible. 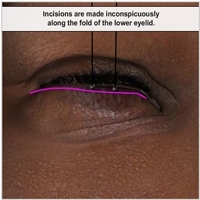 To begin, Dr Miroshnik will first carefully make an incision in the fold of the upper eyelid. Skin & Muscle Removal Using a variety of surgical instruments, Dr Miroshnik will carefully dissect a layer of excess skin from the upper eyelid, exposing the underlying muscle layer. In some instances, he will choose to remove a small strip of muscle from the upper eyelid. 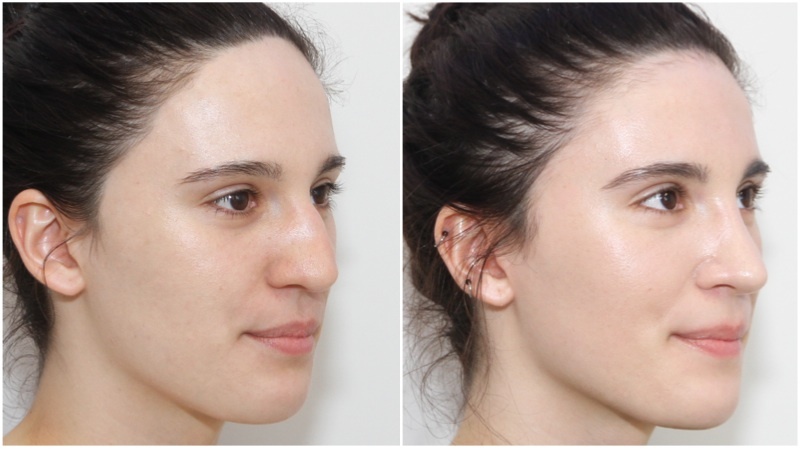 Fat Removal In order to gain access to the two fat deposits in the upper eyelid, Dr Miroshnik must first make very small incisions in the orbital septum, which is a thin membrane that lies between the layers of muscle and fat. By pressing on the upper eyelid, Dr Miroshnik will expose the fat deposits through each of the incisions. Using a series of instruments, he will then remove a variable portion of fat to reduce the puffy appearance in the upper eyelid. The portion remaining will be allowed to recede back through the opening. Incision Closure After sculpting the fat deposits, Dr Miroshnik will close the incisions with a pull-out suture. He will also apply a protective ointment. Recovery As with any surgical procedure, you will likely experience some discomfort, swelling, and bruising which can be alleviated with cold compresses and pain medication. 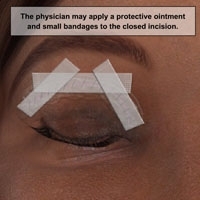 The pull-out suture is typically removed in five to seven days, and you will begin to notice an improvement in the bruising around your eyes in seven to ten days. Although you will feel well enough to return to work in approximately a week, you should continue to avoid strenuous activity such as heavy lifting or exercise for at least two weeks following the procedure. Results You will start to notice the results from your procedure within a few weeks as the bruising and swelling continue to fade. The scars usually fade over time to a very faint, imperceptible white line. While the results of an eyelid surgery are long-lasting, it is important to realise that your face will continue to age. However, eyelid surgery can successfully restore a youthful, revitalised appearance to your eyes for years to come. 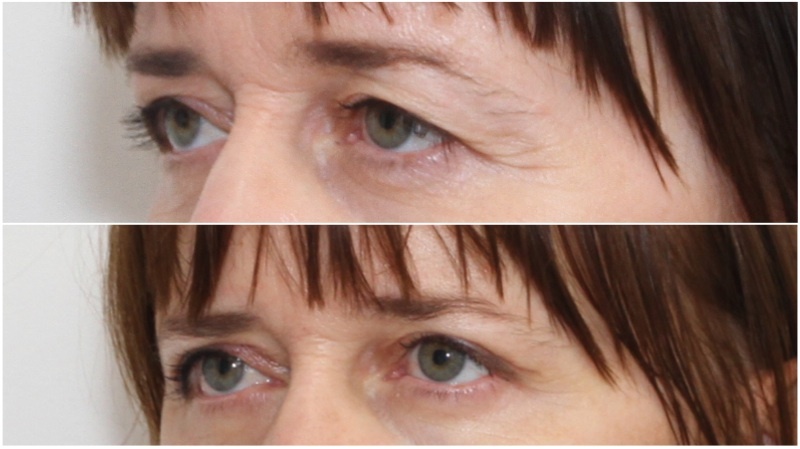 Lower eyelid surgery, or lower blepharoplasty, can help freshen and revitalise your face by reducing the appearance of heavy and sagging eyelids, wrinkles, puffiness, bags and hollowness under the eyes. 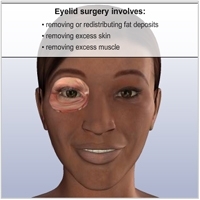 There are several options for lower eyelid surgery. 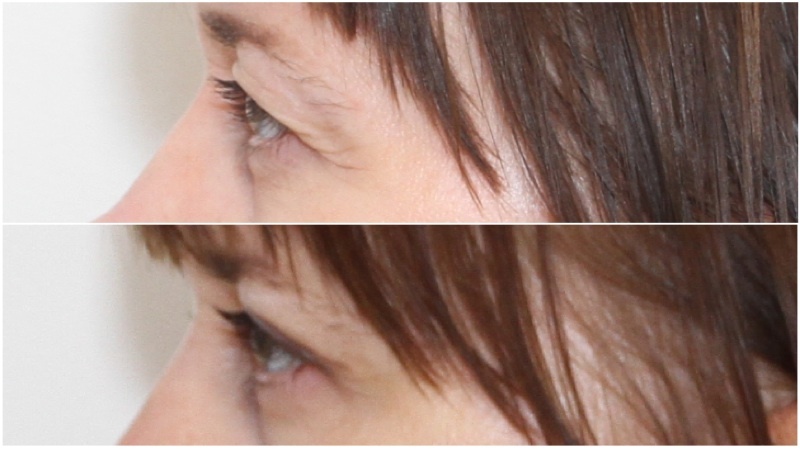 The ‘Inside’ approach involves no external scars and is useful for removing excess fat from the lower eyelid. Alternatively, the ‘Outside’ approach involves a well-hidden incision just below the eyelash margin and is useful when there is also excess skin involved. Sometimes, a mid-face lift is also an alternative for those who want to rejuvenate the appearance of the lower eyelid and cheek area. 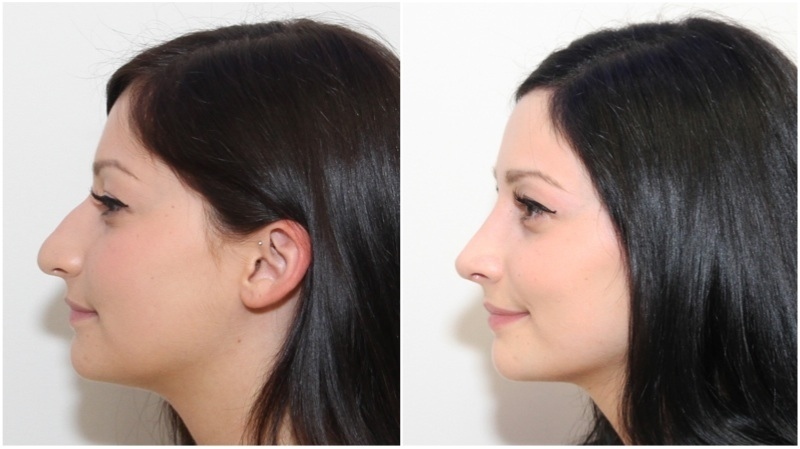 Dr Miroshnik will help you decide which procedure is best for you during your consultation. For more information on each of these individual procedures, please click on one of the subheadings above. Introduction Over time, the eyes undergo changes that often make people feel as if they appear sad or tired. The aging process can cause the eyelids to sag and droop, which in combination with bags and puffiness can make you look tired and older than you really are. Lower eyelid surgery, or lower blepharoplasty, can help freshen and revitalise your face by reducing the appearance of heavy and sagging eyelids, wrinkles, puffiness, bags and hollowness under the eyes. 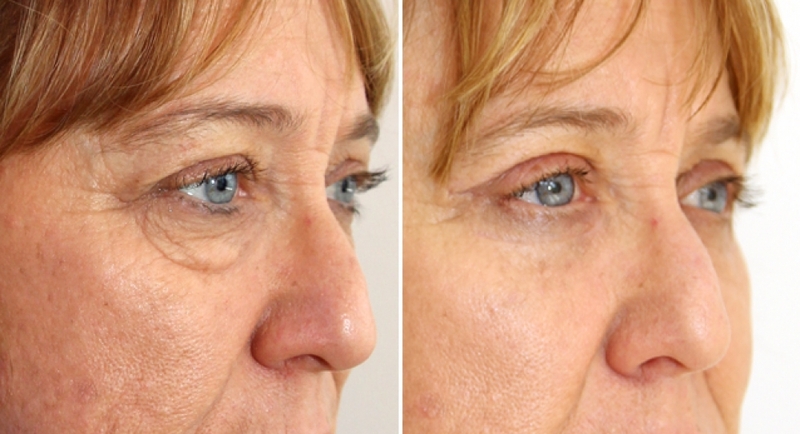 For lower eyelid rejuvenation, the role of the mid face is also important. Due to its proximity, an aging mid face will compound the aging effect of the lower eyelid and may also need to be addressed. 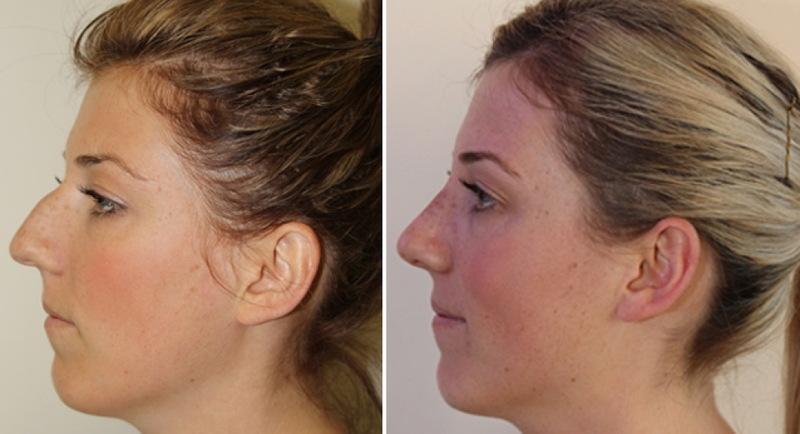 This can be done via the same incision in the concentric mid facelift. How Does Inside Lower Eyelid Surgery Work? While there are several different techniques that Dr Miroshnik can use to alter the appearance of the eyes, the standard surgical technique usually involves removing or redistributing fat deposits, as well as removing excess skin and muscle. Bags and puffiness in the lower eyelid most often result from protruding orbital fat deposits. 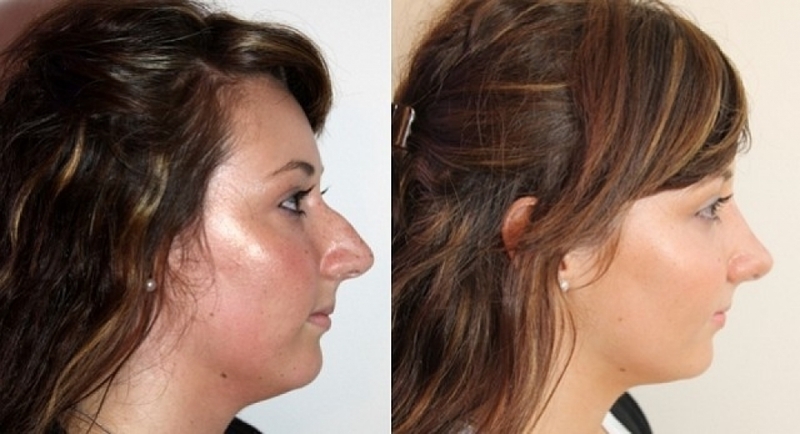 Normally, the orbital septum holds the fat deposits in place. However, over time the orbital septum loses some of its structural integrity and weakens, which allows the fat deposits to slide forward, creating bags and puffiness. 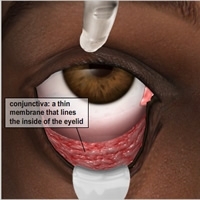 The 'inside' or 'transconjunctival' approach works by removing and sculpting excess orbital fat through an incision in the conjunctiva, which is inside the lower eyelid. It is a good approach to use in a relatively young patient who has minimal skin excess. 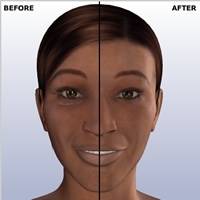 Preparation An eyelid surgery procedure may last approximately one to two hours, depending on the extent of treatment. Prior to the start of your procedure, the treatment area will be cleansed and anaesthesia will be administered. The procedure may be performed under local anesthesia with sedation, in which the eyelids and surrounding areas are numb and you are in a relaxed state. Alternatively, a general anaesthetic may be used, in which you are asleep. 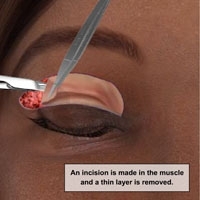 Incisions Dr Miroshnik will use a retractor to carefully pull the lower eyelid away from the eye and expose the conjunctiva, which is a thin membrane that lines the inside of the eyelid. A shield may be applied to your eyes in order to protect them during the procedure. Dr Miroshnik will make a small incision in the conjunctiva by guiding a cautery device along the conjunctiva, exposing the three orbital fat deposits. Fat Sculpting In order to sculpt the orbital fat, Dr Miroshnik will carefully clamp each fat deposit with a pair of haemostats. 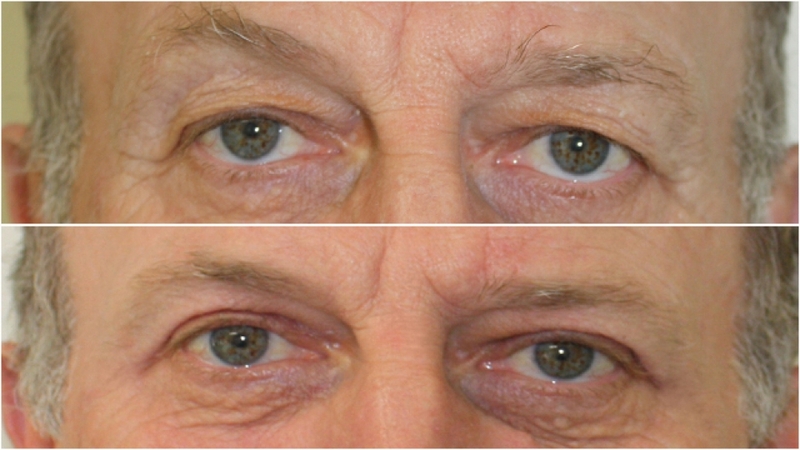 He will then carefully remove any excess fat, reducing the appearance of bags and puffiness in the lower eyelid. 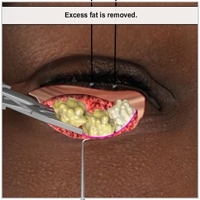 After cauterising the remaining orbital fat, the fat deposit will be allowed to recede back through the opening. Closure After sculpting the fat deposits, Dr Miroshnik may choose to close the incisions with one or two absorbable sutures. However, most often sutures are not required and the incisions will close on their own. Recovery As with any surgical procedure, you will likely experience some discomfort, swelling, and bruising which can be alleviated with cold compresses and pain medication. You will begin to notice an improvement in the bruising around your eyes in seven to ten days. Although you will feel well enough to return to work in approximately a week, you should continue to avoid strenuous activity such as heavy lifting or exercise for at least two weeks following the procedure. Results You will start to notice the results from your procedure within a few weeks as the bruising and swelling continue to fade. In addition to being less invasive, and a faster recovery time, one of the benefits of the transconjunctival approach is that there is no visible external scar. While the results of an eyelid surgery are long-lasting, it is important to realise that your face will continue to age. However, eyelid surgery can successfully restore a youthful, revitalised appearance to your eyes for years to come. Introduction Over time, the eyes undergo changes that often make people feel as if they appear sad or tired. The aging process can cause the eyelids to sag and droop, which in combination with bags and puffiness can make you look tired and older than you really are. Lower eyelid surgery, or lower blepharoplasty, can help freshen and revitalise your face by reducing the appearance of heavy and sagging eyelids, wrinkles, puffiness, bags and hollowness under the eyes. 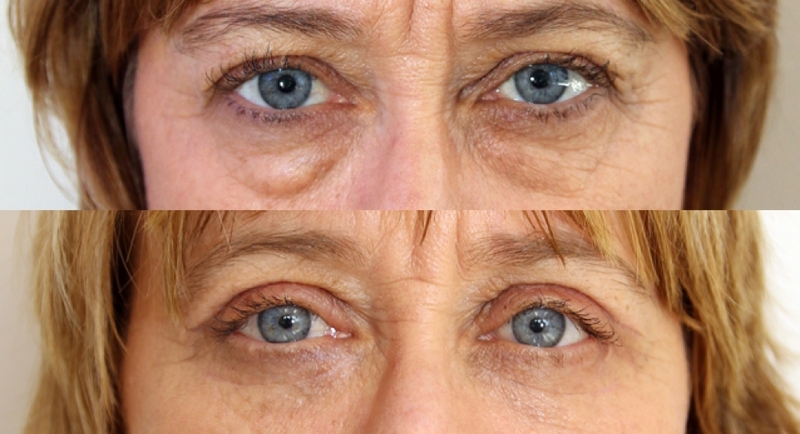 For lower eyelid rejuvenation, the role of the mid face is also important. Due to its proximity, an aging mid face will compound the aging effect of the lower eyelid and may also need to be addressed. 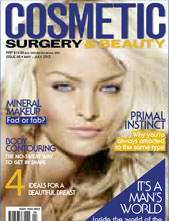 This can be done via the same incision in the 'concentric' mid facelift. How Does Outside Lower Eyelid Surgery Work? While there are several different techniques that Dr Miroshnik can use to alter the appearance of the eyes, the standard surgical technique usually involves removing or redistributing fat deposits, as well as removing excess skin and muscle. Bags and puffiness in the lower eyelid most often result from protruding orbital fat deposits. Normally, the orbital septum holds the fat deposits in place. 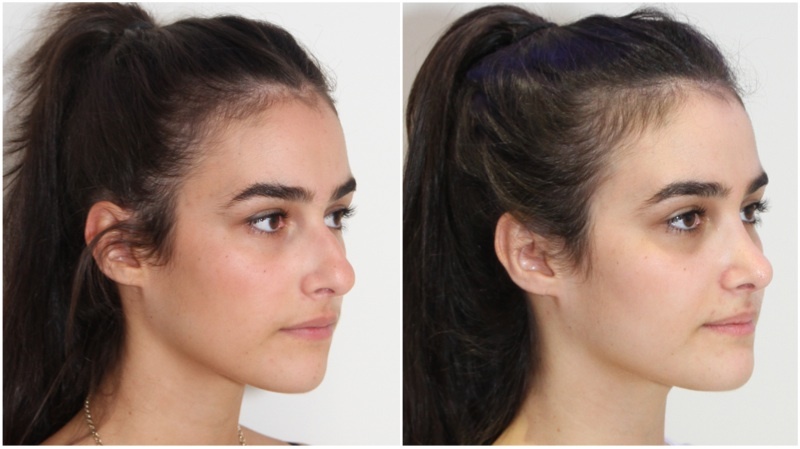 However, over time the orbital septum loses some of its structural integrity and weakens, which allows the fat deposits to slide forward, creating bags and puffiness. The 'outside' or 'transcutaneous' approach works by redistributing or sculpting excess orbital fat through an incision on the outside of the lower eyelid. 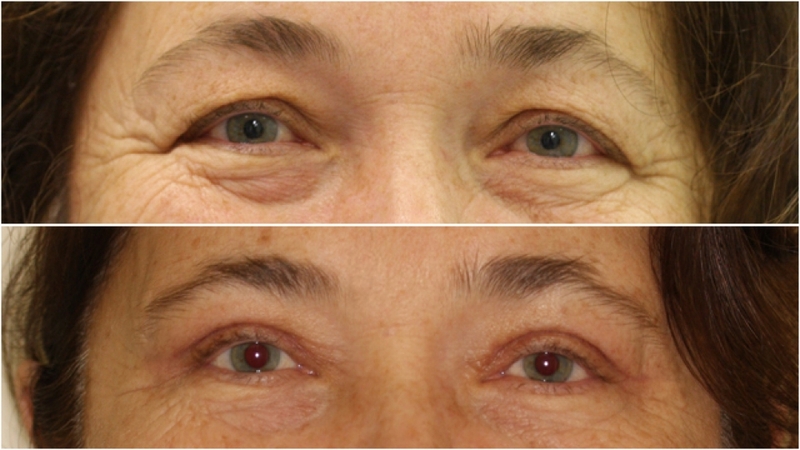 Unlike the transconjunctival approach, excess skin is also typically removed to correct laxity in the lower eyelid. 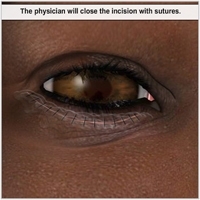 Incisions Prior to making the incision, Dr Miroshnik may choose to place a suture in your lower eyelid to help keep your eye closed during the procedure. 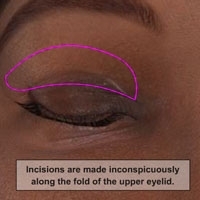 He will then draw incision guidelines along the fold of the lower eyelid to ensure that the resulting scar is hidden in the natural contours of your face. A small incision is then made in the skin exposing the underlying muscle. 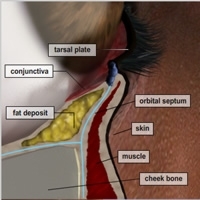 Exposing the Orbital Septum To gain access to the orbital fat, Dr Miroshnik makes a small incision in the muscle layer. Through this incision, he dissects the skin and muscle away from the underlying orbital septum. 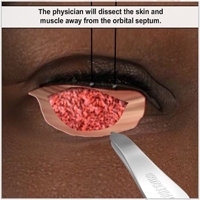 This allows Dr Miroshnik to pull the skin and muscle layers away from the orbital septum and subsequently expose the orbital fat in the lower eyelid. 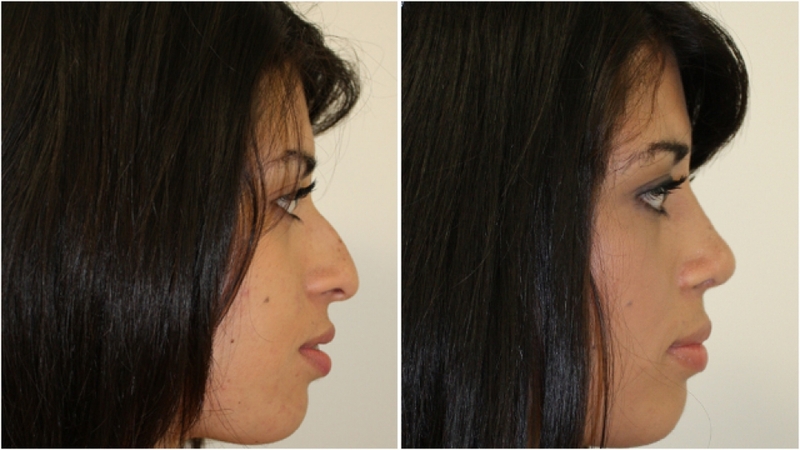 Fat Repositioning or Sculpting Once the orbital septum is exposed there are quite a number of procedures that can be performed. These can be divided into fat-conserving and fat-removing procedures. 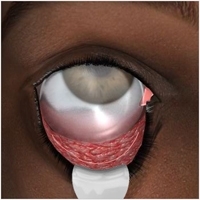 The orbital septum may be carefully opened to expose the three orbital fat deposits of the lower eyelid. 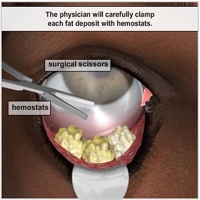 This animation shows each of these fat deposits being trimmed, however the fat deposits will often be conserved and simply redistributed and sutured to areas of hollowness in the surrounding area. 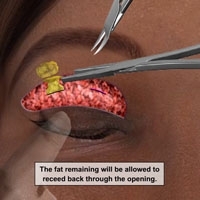 In an alternative fat-conserving procedure, the orbital septum may be left completely intact and plicated or strengthened with a series of sutures to stop it bulging. Dr Miroshnik will help you decide during your consultation, which of these procedures is best for you. Excess Skin Removal If you have excess skin in the lower eyelid, a small amount will likely be removed. This will remove with it any wrinkles caused by its redundancy. 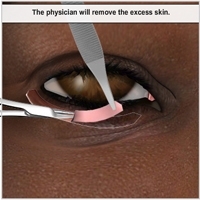 This animation shows it being removed with the use of surgical scissors. Closure At this stage, after making sure there is no bleeding, Dr Miroshnik closes the incision with sutures. This is often done with a fine, running, non-absorbable suture that is simply pulled out in the office after five to seven days. Results You will start to notice the results from your procedure within a few weeks as the bruising and swelling continue to fade. The scar will fade to an inconspicuous line hidden along the contours of your lower eyelids. While the results of an eyelid surgery are long-lasting, it is important to realise that your face will continue to age. However, eyelid surgery can successfully restore a youthful, revitalised appearance to your eyes for years to come.